It’s common knowledge that the main reason we have to brush (and floss) everyday is to prevent the buildup of plaque on and around our teeth. 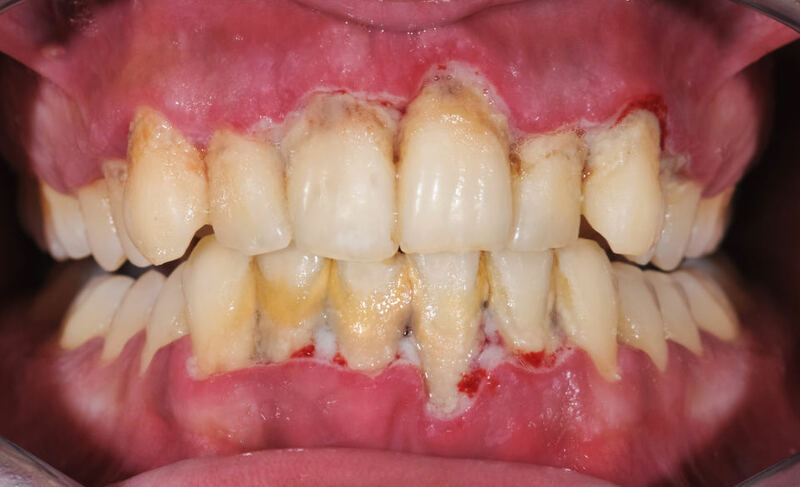 Insufficient dental hygiene leads to a pale yellow to brown discolouration of the teeth; this is not plaque (which is colourless) – this buildup is tartar. When plaque isn’t fully cleaned from the teeth and is given time to build up, it eventually solidifies and becomes mineralised. The coating can cover your teeth and climb up around your gums, making the inside of your mouth a little unpleasant. This mineralised, discoloured plaque is called tartar and can lead to dental health issues. Unfortunately, tartar contains a large amount of the harmful bacteria which caused the plaque to form in the first place. This bacteria is what can threaten your oral health. Tartar (or calculus) binds exceptionally well to the teeth and once formed, cannot be removed from brushing alone. The discolouration does not necessarily guarantee the development of gum disease, but if you develop tartar it’s important to implement a good brushing routine to prevent escalation. The first problem which can occur is that getting all the benefits of brushing and flossing becomes more difficult (because you can’t penetrate the calculus) and therefore your tooth enamel is more at risk from deterioration from the various bacteria which linger in the mouth. This leads to tooth decay and cavities which can be treated by your dentist, but which also leave you at risk of developing gum disease. When tartar develops on the gum line, the local bacteria can cause inflammation, discomfort and a form of gum disease called gingivitis. The gums will become red and puffy around the teeth, as well as more sensitive and prone to bleeding during brushing. If untreated, the condition can progress to periodontitis – a much more severe stage of gum disease. The tartar in-between teeth and lining the gums causes serious inflammation, threatening teeth loss in bad cases. The good news is that tartar, while stubborn, can be treated and even removed with the right procedure. Preventative care – This is what everyone can do everyday, twice a day – brush their teeth. Tooth brushing should last 2 minutes (one way to track time is to divide each row into thirds, and brush the front, top and back of each 3rd for six seconds before moving on) with a proper ~1500 ppm fluoride toothpaste.It’s also beneficial to use an antibacterial mouthwash and to floss once per day, making sure to clean right up and under the gums to prevent the kind of tartar buildup that leads to periodontitis. Professional cleaning – With professional dental cleaning the bulk of the tartar will be removed using a carefully calibrated ultrasound instrument, designed to break up the material non-invasively. Teeth are then scaled, polished and given a fluoride treatment to help prevent decay on the newly-cleaned surface. Risk factors – Plaque is formed by the bacteria that reside in your mouth; these bacteria love starch and sugary foods, so try to maintain a diet with as little unnecessary sugar as possible. Tartar also forms much more easily for smokers than for nonsmokers – smoking is terrible for your teeth, especially as you get older, so consider quitting. http://kingswaydentist.ca/wp-content/uploads/2017/07/tartar-periodontitis.jpg 584 960 Chris Kerr http://kingswaydentist.ca/wp-content/uploads/2017/03/KINGSWAY-1024x301.png Chris Kerr2017-07-10 17:06:542017-07-10 17:10:11What is Tartar, Exactly?